Light, airy and well-proportioned five-bedroom, Edwardian family home with the perfect blend of period detail and contemporary modern living. 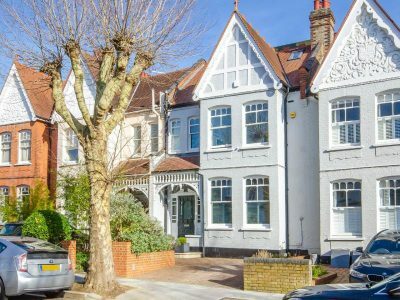 Located just south of Fortis Green, this must-see is well located for excellent local schools and has the benefit of being a level walk away to the Tube at East Finchley. Original features are plentiful in this fine example of an Edwardian family home, with fireplaces in most rooms, a beautiful staircase with ornate newel posts and neutral, tasteful dÃ©cor throughout. The original front door leads in to the stunning tiled entrance hallway, that in turn leads in to the elegant front reception room that has a fantastic original fireplace. The rear reception and kitchen have been opened up to create a wonderful light family space with floor to ceiling sliding doors leading out to the garden. There is also a useful downstairs cloakroom and storage on this floor. On the first floor, off the generous landing, there are three bedrooms, a large family bathroom and separate utility room. Continuing upstairs there are two further bedrooms, bathroom, a light-filled study area with fitted desk and storage. The low maintenance garden currently has an synthetic lawn with borders to the side and a paved patio area. To the front of the house the garden includes a useful flight of external steps which access storage in the cellar. All in all, this is a beautiful home in a premier road located just south of Fortis Green, equidistant to both Muswell Hill and East Finchley with excellent local primary and secondary schools close by.